The coupled mechanical and water retention elasto-plastic constitutive model of Wheeler, Sharma and Buisson (the Glasgow coupled model, GCM) predicts unique unsaturated isotropic normal compression and unsaturated critical state planar surfaces for specific volume and degree of saturation when soil states are at the intersection of mechanical (M) and wetting retention (WR) yield surfaces. Experimental results from tests performed by Sivakumar on unsaturated samples of compacted speswhite kaolin confirm the existence and form of these unique surfaces. The GCM provides consistent representation of transitions between saturated and unsaturated conditions, including the influence of retention hysteresis and the effect of plastic volumetric strains on retention behaviour, and it gives unique expressions to predict saturation and de-saturation conditions (air-exclusion and air-entry points, respectively). Mechanical behaviour is modelled consistently across these transitions, including appropriate variation of mechanical yield stress under both saturated and unsaturated conditions. The expressions defining the unsaturated isotropic normal compression planar surfaces for specific volume and degree of saturation are central to the development of a relatively straightforward methodology for determining values of all GCM parameters (soil constants and initial state) from a limited number of laboratory tests. This methodology is demonstrated by application to the experimental data of Sivakumar. Comparison of model simulations with experimental results for the full set of Sivakumar’s isotropic loading stages demonstrates that the model is able to predict accurately the variation of both specific volume and degree of saturation during isotropic stress paths under saturated and unsaturated conditions. Martí Lloret-Cabot was formerly with Universities of Strathclyde and Glasgow, Glasgow, UK. Marcelo Sánchez was formerly with University of Strathclyde, Glasgow, UK. 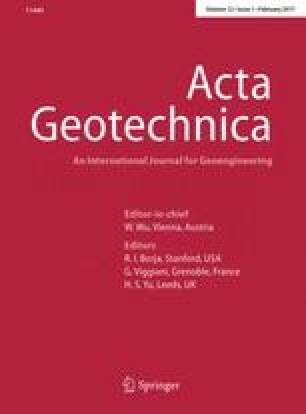 The first author acknowledges the financial support by the Synergy Postgraduate Scholarships Scheme and the Australian Research Council Centre of Excellence in Geotechnical Science and Engineering (CGSE).